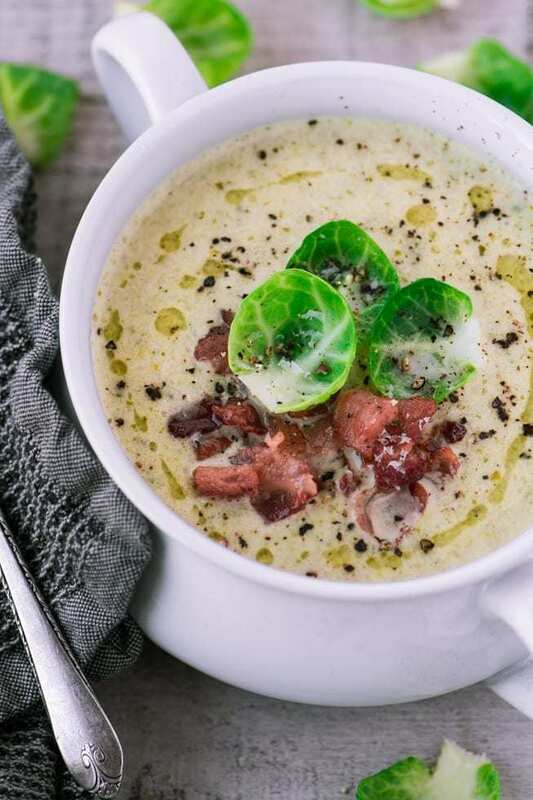 My Creamy Brussels Sprout and Bacon Soup is a comforting meal for a chilly night, just add a simple salad, hunk of whole grain bread, and a glass of wine. Wash and trim the stems from the sprouts. Cut them in half, or in quarters if they are very large. Drizzle them with olive oil, and then sprinkle liberally with salt and pepper. Roast the sprouts for about 20-30 minutes, just until they have softened and have taken on a little color. Stir them around on the pan a few times during cooking. Set aside. Cook the bacon until crispy in a large soup pot. Remove the bacon with a slotted spoon to paper towels to drain. Leave about 3 Tbsp of the bacon fat in the pan and add the shallots. Saute them for about 5 minutes, until they are softened, don't let them brown. Add the chicken stock and the sprouts to the pan, and bring up to a simmer. Cook gently for 5 minutes. Working in batches, puree the soup. I used my food processor, but if you prefer a chunkier texture you could use an immersion blender. Return the pureed soup to the pot. Add the cream to the soup and reheat to a simmer. Taste to adjust the salt and pepper, and then, once the soup is nice and hot, remove from the heat and add the cheeses, slowly, and stir until it is completely melted. Serve hot with a good helping of crisp bacon in the center.